We love to walk our dog in Holland Park in London. The park isn’t as busy as Kensington Gardens and Hyde Park, but it does have a decent amount of traffic. Even though Miles grew up on one of the busiest streets in Boston he does not like city streets and noise. A few weeks ago we decided to see where one of the smaller streets near the park led in hopes that we could make it home and avoid most of the busy streets with the cars and big red buses. He really hates the red buses. Not only is this street a wonderful shortcut, but we found a quaint pub that we didn’t know about. Thank you Miles! 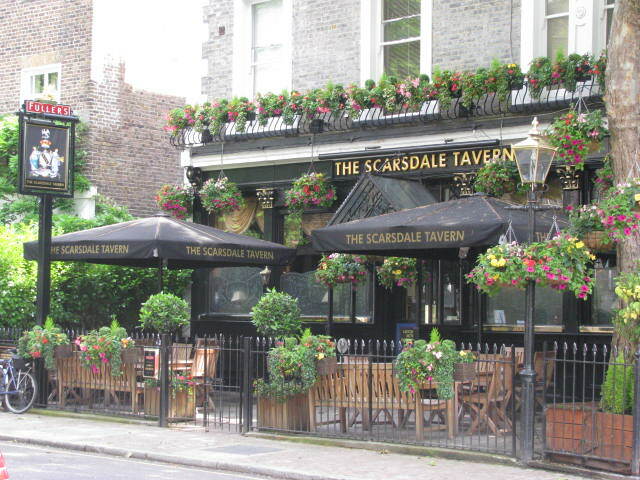 The Scarsdale Tavern, located in Kensington, is a traditional pub that is close to Holland Park, Hyde Park, and Kensington Gardens. Last week we were on our way to meet up with some friends and they were running late. So we hopped into this pub to have a pint and to share an appetizer to pass the time. 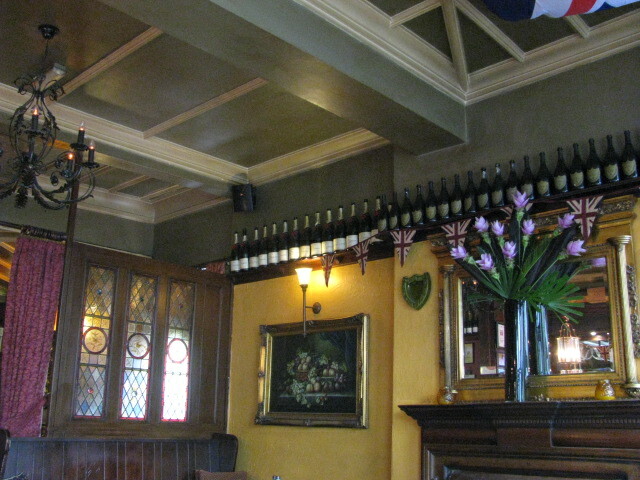 The inside of the pub is inviting and there is much to look at. I was happy that they had the French Open on the telly. 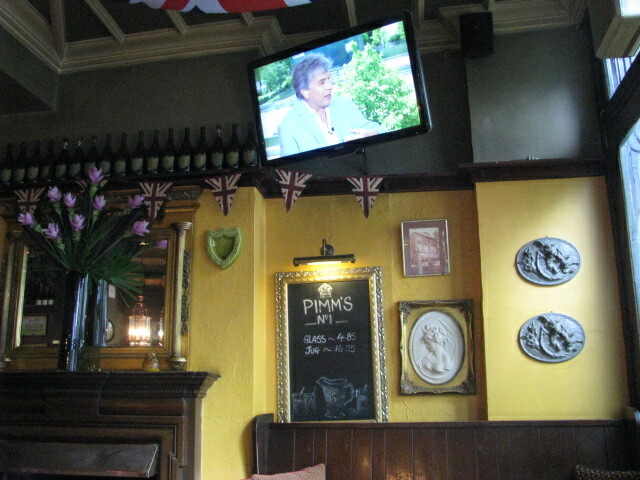 Many of the pubs here do not show sports. And many of you know I love sports. Obviously this was an added bonus. After we met up with our friends and had a delightful afternoon, on our way home we stopped at the pub again to enjoy a drink on their terrace. The place was busy and we ran into another friend. How in the world did we not know about this place until a few weeks ago? I would give this pub 4 out of 5 stars. This rating may change, since in the winter I think they have fires going and after spending a cold day by a fire reading a book, well how could I not bump it up. But I don’t want to get ahead of myself. This research will have to continue folks. 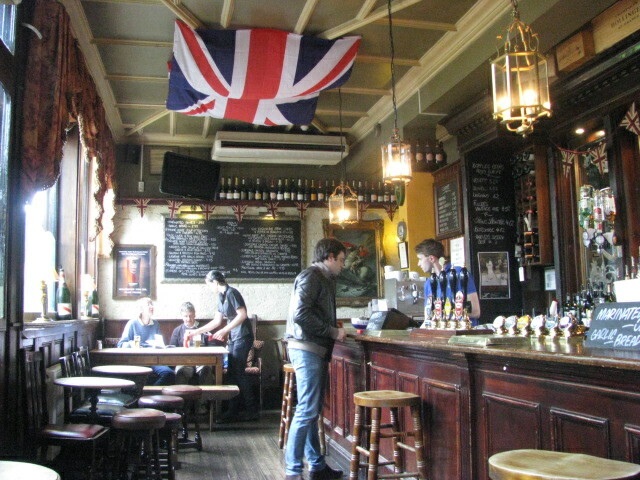 This entry was posted in Weekly Pub and tagged 50 Year Project, England, English Pubs, Holland Park, Hyde Park, Kensington Gardens, Life, London, Photography, Photos, Pubs, Scarsdale Tavern, Travel Blog, Travel Photo, Travel Photos. Bookmark the permalink. It does look cozy! I’m excited to hear how it is in the winter! Thanks…now time to put on my thinking cap for the next one…more research! If you are ever in the New Forest, ‘Brockenhurst’ check out the ‘Foresters Arms and Snakecatcher’ be interesting to know your view. They have gone full circle, traditional pub, to eating pub and back again. But they do food as well now. Darts and pool etc. I do love a game of darts. I’ll play pool, but I’m not good and I usually end up cheating 🙂 I’ll have to remember this one if I’m in the area. Thanks. I always love suggestions!!!! So, would it qualify as your local? Can you pop in with Miles after his walk? It is a little further away than our usual, but I really like it so it may become the new local. And yes, Miles is welcome. He would love to sit there and have people oooo and ahhh over him. A dog who can sniff out ale houses, eh? He’s got a bit o’ the hobbit in him, make no mistake! Sounds like a place that would indeed be pleasant to visit in the winter months. I hope you do so and post about it again when the time comes. Reading a book by the fire sounds so lovely. Well done Miles. And well done you. So many pubs are closing and being converted into flats it is our civic duty to support those still going! I promise to do my best Isobel…I take these duties very seriously. I think Miles is the better guide and his smile is cuter. Thanks Nia. Good for Miles!!! It sounds and looks like a lovely place to kick back!!! I think it might become a fave. Looks like a wonderful place to go in for a bit and soak in the atmosphere. What?!?!?! A pub without at least a double-digit number of TVs for anyone at any angle? i didn’t know they still exist! Come to London…they do. People go to hang out and talk. Can’t wait to try it out in the winter with the fireplaces. Adorable, both Miles and the pub. Thanks…Miles is starting to get an even bigger head. He was told he was gorgeous on our walk this morning. It is wonderful to venture off your normal route. i have found many unexpected joy and places just poking around. Good for you. The decor of this pub is so lovely and refreshing- a place perhaps where people actually talk to one another. Yes conversations do happen there and in fact, we made a friend there. So far, the pub has a lot going for it! This looks like the perfect little pub. I hope you can share some photos of Miles in his new environment sometime! That’s a good idea. I can dress him up and totally embarrass him! What a nice looking little pub! Maybe Miles can sniff more of these out for you! Cool! Do they let Miles inside? When I was visiting Amsterdam I found a lot of places didn’t mind if people brought their pets inside. Unlike here of course. Yep Miles can go, but more than liking we would stay on the terrace with him. Since it is close I’m sure we will be hopping in on occasion. I think you could probably live in London for years and never discover all the cool little places. Telly is one of the words I’ve picked up on and funny enough, I don’t watch a lot of it. I need to work on saying pounds or quids. I keep saying bucks, which gets a little confusing. May I ask how long are you in London? Just curious. At least two years…after that we’ll see. Tell Miles I said he needs to ask for a raise of some sort !!!! Shhhh…he is so spoiled, even though he thinks that he isn’t. Maybe I’ll consider an extra bone a day–or a half. I enjoy reading your critics. You explore all the key points that make the difference between a good and a not so good pub. I’ll do my best. Thanks for the encouragement.